The blog THE HOCKEY SCHTICK claims that "temperature drives CO2 levels, not man-made CO2". 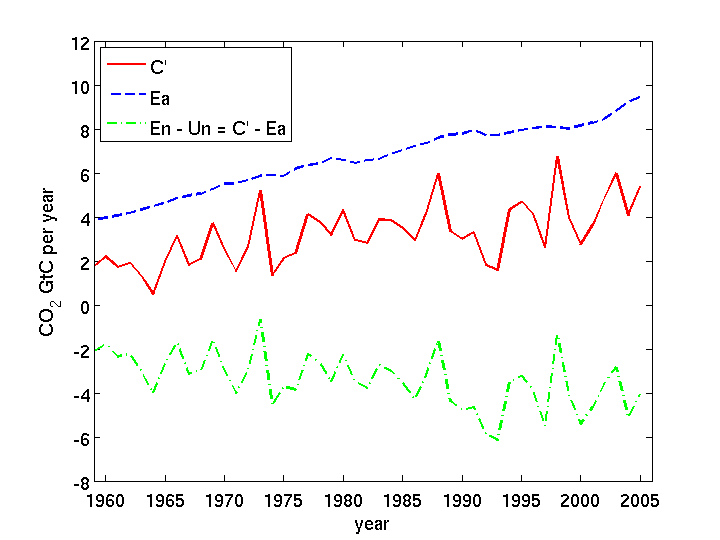 The paper "Atmospheric verification of anthropogenic CO2 emission trends" is cited as proof. A recent paper published in Nature Climate Change finds a disconnect between man-made CO2 and atmospheric levels of CO2, demonstrating that despite a sharp 25% increase in man-made CO2 emissions since 2003, the growth rate in atmospheric CO2 has slowed sharply since 2002/2003. The data shows that while the growth rate of man-made emissions was relatively stable from 1990-2003, the growth rate of atmospheric CO2 surged up to the record El Nino of 1997-1998. Conversely, growth in man-made emissions surged ~25% from 2003-2011, but the change in the growth rate of atmospheric CO2 has flatlined since 1999 along with global temperatures. The data demonstrates temperature drives CO2 levels due to ocean outgassing, man-made CO2 does not drive temperature, and that man is not the primary cause of the rise in CO2 levels. but the explanation for changes in CO₂ causing changes in temperature despite lagging temperature is unclear. Is it true that temperature leads and drives CO₂ levels? Why or why not? The idea that "global temperatures cause the increase of CO2." is fairly easily refuted. The line of reasoning is that the solubility of CO2 in water decreases as temperature increases, so the rise in global temperature implies that the oceans will have released some of the dissolved CO2 that it contains. The premise is correct, but the conclusion is a Non sequitur as it ignores the fact that the solubility of CO2 in water also depends on the difference in partial pressure of CO2 between the ocean and the atmosphere. As we have released CO2 from fossil fuels into the atmosphere, the partial pressure of CO2 in the atmosphere has risen, and so the oceans have been taking up more CO2, not less. The argument is easily refuted by the observation that the rate at which atmospheric CO2 levels are rising is less than the rate at which we are releasing CO2 into the atmosphere from fossil fuel use, which implies that the natural environment must be a net carbon sink, taking in more carbon each year than it emits. This can be rearranged to give an estimate of the difference between annual emissions from all natural sources and annual natural uptake by all natural sinks. We have accurate, reliable data for the growth of atmospheric CO2 and for anthropogenic emissions (for details, see Cawley, 2011). Both of these are displayed below, along with an estimate of the net natural carbon flux En - Un. The fact that the net natural flux is negative clearly shows that natural uptake has exceeded natural emissions every year for the last fifty years at least, and hence has been opposing, rather than causing the observed rise in atmospheric CO2. Some time back, I wrote a journal paper refuting a related climate myth, which outlines some of the evidence that the rise in atmospheric CO2 is anthropogenic, and is not a natural phenomenon. Gavin C. Cawley, "On the Atmospheric Residence Time of Anthropogenically Sourced Carbon Dioxide", Energy & Fuels, volume 25, issue 11, pages 5503–5513, 2011. I find it hard to understand how this argument can be so ubiquitous on climate blogs, given that it is so easily refuted. For further information, see the many articles on SkepticalScience.com addressing this issue (and other climate myths). The reason usually given for temperature driving CO2, rather than the other way round is Henry's Law, which says that the solubility of a gas in a liquid is proportional to the difference in partial pressure of the gas in the atmosphere and the concentration in the liquid, and that the constant of proportionality depends on temperature. The argument goes that ocean temperatures have risen, which means that the constant of proportionality has changed and thus the oceans will begin degassing. However, this ignores the other part of Henry's Law. Anthropogenic CO2 emissions have increased atmospheric CO2, which has increased the pressure differential, which in turn increases the solubility of CO2, and the oceans become net carbon sinks. The question is, which wins out, the temperature driven degassing or the partial pressure difference driven uptake? We can be very confident that the oceans are not a net source of CO2 as (i) the mass balance indicates the natural environment is a net carbon sink, if the oceans were a net source, the biosphere would need to be an unfeasibly large carbon sink for there to be conservation of mass and (ii) the oceans are becoming more acidic, which is what you would expect if it were a net carbon sink. Another line of argument is given by looking at the changes in atmospheric CO2 between glacial and interglacial periods, which suggests that we should expect to see only about 8ppmV increase in atmospheric CO2 per degree of warming. We have seen an order of magnitude more, which means that Henry's law (even ignoring the change in partial pressure due to anthropogenic emissions) cannot explain both the current rise in CO2 and these prehistorical increases. As to why CO2 lags temperature on a long timescale, the Skeptical science link given in the question seems to explain it pretty well. As to short term correlations between CO2 and temperature, these are likely due to ENSO (El-Nino), which causes changes in both temperature and precipitation in the Americas. These in turn cause changes in vegitation growth and die back and as a result, changes in the rate of growth of CO2. This was notices by Bacastow back in the 1970s (see also Jones et al.). Note I emphasised rate of growth of CO2. The long term rise in CO2 depends on the average value of CO2, the interanual variations in the rate have almost no effect on the long term increases. This is an error that Prof. Salby makes in the talk he gave to the Sydney instritue, and my explanation of this (slightly complex) error is given here. I can't do much more today, I'll try and add some more references later, however my Energy and Fuels paper contains enough information to show that the conclusions of the blog article are incorrect (I wish they weren't!). Has the Urban Heat Island effect on the US temperature record been underestimated?